As you may have noticed, denim/chambray skirts of all lengths are trending big time as of late. Though I'm not a trend based blogger, these types of skirts have come and gone so many times that they are now "classic" in my mind. Given the length and versatility of maxi skirts, I really wanted a button down one for some time and I finally nabbed one from ModCloth during one of their (many) massive sales this summer. (The Ensemble Ingenuity Skirt is currently sold out, but HERE is the link in case you wanna eyeball it for returns in your size). Last summer I barely blogged due to travel, working too much on other projects, and just life. I didn't get a chance to showcase my summer style too much, which is often all about crop top/bandeaus with classier skirts. If you remember me doing that a ton from 2-3 years back, fear not as I'm CLEARLY not done with the style. Last summer I never really got a chance to wear an outfit like that due to schedule/restrictions on what I could wear to various events and this summer it's been raining so much! It may almost be September and summer festivals are coming to a grinding halt, but I decided to go for a very bohemian look that is appropriate for concerts as well as tons of outdoor summer (and balmy autumn) outings. My rule with skin is that if a large part of your body is covered, you can be more scantily clad with other parts of your body. This rule applies double if the part of your body that's covered--in this case my legs--is loose fitting over hugging. If I were wearing a body con maxi skirt, no way in hell I would be comfortable wearing that with a bandeau! To each their own, but this is my style rule that has worked quite well for me over the years. And if nothing else, nobody will mistake you for a member of the Duggar tribe in this look! The flower top I got from Forever 21 and the shoes are Jessica Simpson via Poshmark. I wanted to subtly mix prints (because I'm me) so I added my lemon Kate Spade bag because the colors matched my top. 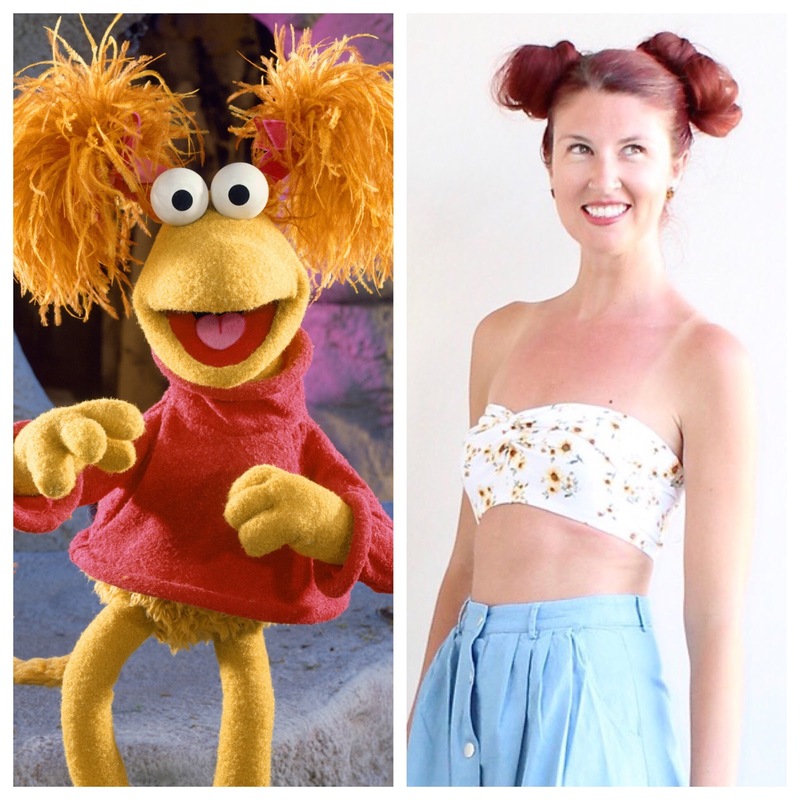 Twinsie Tuesday will be back NEXT Tuesday, but for now enjoy a Fraggle Rock themed Twinsie Tuesday/Who Wore It Best feature! How's everyone's week going? I'm a little stressed because I'm trying to get a lot done this week and have some huge decisions to make that have official deadlines coming up now! Everything else is peachy though and I'm relieved the weather has been more summery here--finally! On Blair Uncensored today, I have a post all about seeing Poison/Def Leppard in concert earlier this month. Check it out HERE! Have a great Tuesday!